Pollo the Robot: Why don't you just do what Superboy-Prime did and punch the wall? Linkara: Oh, I tried that already, Pollo. I ended up hitting the wall for like half an hour and the only thing I got out of it was that Donna Troy got a new origin and Doctor Insano became a guy. Pollo the Robot: Um, Doctor Insano was always a guy. Linkara: Yeah, just keep telling yourself that. —Spoony's review of Clones of Bruce Lee. An example of a Retcon caused by forces within the story itself, usually using Time Travel of some sort to alter history. For example, let's say that the author of a novel series was dissatisfied at the way she'd killed off a character in an earlier book. Instead of just having him show up and explain that he was Only Mostly Dead, she has the other characters pulled back in time by an evil plan of the Big Bad; in the process, they manage to prevent the events that lead to death of the character, and when they get back, ta-da! There he is, good as new. Whether or not characters will remember the pre-retconned state depends on the story. Note that this applies only to actual retcons; something like Back to The Future, where changing the past is part of the original thrust of the story, doesn't count. Often (especially lately) used to explain continuity gaps and mistakes. Transformers, of course, has one of its own: the the Unicron Singularity, which ripped and tore at the fabric of time and space in a way that essentially opens up a planet-sized plot hole just to make room for itself to fill it. The Unicron Singularity didn't exist as this at first, and it was transformed into one by the club comic writers to account for some (admittedly minor) inconsistencies between Transformers Energon and Transformers Cybertron. Mind you, these are only minor in comparison to the humongous plot holes that already populated the rest of the entire Transformers multiverse, which did not have such a black hole. There actually exists a transformer, Vector Prime, who was tasked by Primus to protect the stability of the timeline- in other words, the number of plot holes in Transformers is so bad, it is actually an in-universe threat, and there needs to be someone to keep the holes and inconsistencies from destroying everything. He does his best to fix things (usually retconning them from outside the timeline to cover inconsistencies, but coming in person for tremendous holes like the Singularity) so presumably any inconsistency we see was simply recorded before he got around to it, and our media are ripple effect proof. Played for laughs in Excel Saga, where the Great Will of the Macrocosm has to reset the plot multiple times per episode. Done several times throughout the backstory of xxxHolic and Tsubasa Reservoir Chronicle. You'd need a diagram drawn by M. C. Escher in seven dimensions to figure out the order of which retcon came before which, though. Altogether, they produced several clones, eliminated the royalty of a kingdom as royalty while leaving their children the prince and princess in place (their ancestor from another dimension had to come in to act as a placeholder and keep causality intact), caused reality to not notice that someone had died for several hundred years, at which point it had always noticed (except for the aforementioned clones and friends), and both added and removed the main character's parents from existence (their existence in-story predated the retcon somehow, and the protagonist managed to survive his parents ceasing to have ever existed via a Deal with the Devil). In Yakitate!! Japan, the main character manages to, at the end of the second season, make a bread so delicious, it sends the judge back in time to meet his long-deceased parents and prevent their death. When back in the judging hall, the judge's parents have been watching the contest the whole time, confusing even the main character at the Judge's reaction to the bread. Stone Ocean, the sixth story arc of JoJo's Bizarre Adventure, ends with the antagonist Enrico Pucci recreating the universe. The next story arc, Steel Ball Run, is a Continuity Reboot that takes place in the same time period as the first story arc, Phantom Blood. In RahXephon, this is, more or less, the eponymous robot's true power, which Ayato uses at the end to erase the plot and give himself and everyone he knew a normal, happy life (playing hell with the already complicated family trees in the process). In fact, the entire story comes about because a long-past Cosmic Retcon went badly... really badly. Occurs in Puella Magi Madoka Magica where the main character becomes a goddess in order to prevent Magical Girls from turning into witches. She wished for the ability to change this personally, by her own hands, for every girl who falls, past; present; and future; in every timeline. In the new timeline, witches never existed; although Magical Girls still have to have to face demons and their own despair. The DCU has done this several times, starting with Crisis on Infinite Earths. Usually, it's part of a larger effort to make the characters more accessible and marketable. Usually, it fails. Zero Hour: Crisis in Time, the first sequel to Crisis on Infinite Earths, was the second universe-wide retcon, caused by Hal Jordan and Hank Hall going mad and tampering with the timestream. It created the sliding timescale that the DCU has used since and altered the backstories of several characters, most notably Hawkman and the Legion of Super-Heroes. The picture at the top of the page came from Infinite Crisis. 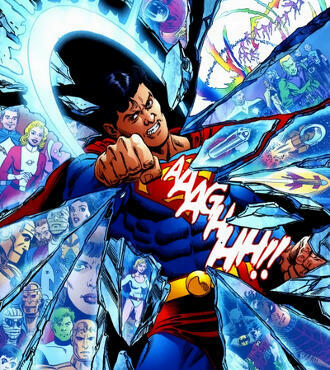 Many of the changes here were caused by Superboy-Prime pounding on the walls of reality, giving rise to the "Superboy Punch!" meme as a way of hand-waving continuity errors. In what looks almost like a parody, at the end of Legion of Three Worlds, he's Hoist by His Own Petard when he Ret Cons himself by punching the Time Trapper, who was his future self. The latter is Ret-Gone outright. Flashpoint, building off The Flash: Rebirth mentioned below, boils down to simply a time-traveller mucking things up and the heroes having to fix it. When The Flash makes the fixes, he's advised that the Vertigo Comics and Wildstorm continuities are fragments of the DCU and need to be merged into a single timeline. It seems to be this merging, not a case of incorrectly repairing history, that causes the retcons. Marvel uses it less often, usually preferring the more "subtle" Sliding Time Scale. This usually prevents the all-at-once changes of a Cosmic Retcon by feeding changes out gradually over decades. Marvel had their own Superboy-Prime for a while in the form of Wanda Maximoff, the Scarlet Witch. When her powers shifted from "control of probability" to "able to reshape reality at will" and she went bugnuts crazy, "Wanda did it" became a very popular Hand Wave for a little while. And before Wanda, they had young Franklin Richards, who used his own reality-altering powers to undo certain unpopular changes to Iron Man and the Wasp following Heroes Reborn. One recent example of a Marvel Cosmic Retcon is the Spider-Man storyline One More Day. The creators of Elf Quest were forced to do this by Executive Meddling: basically, they lost the rights over a large group of characters, the Wavedancers, created as a spin-off by someone Running the Asylum. Because they did want to keep the overall story, a new group of Wavedancers was created in their place, and the original group was handwaved as a dream brought on by Big Bad Winnowill. In The Sandman, Delirium threatened at one point to turn Mazikeen into a demon with only half a face, and "make it so you've been that from the beginning of time". Given that Mazikeen already was a demon with only half a face, it's unclear if Delirium actually did make a Cosmic Retcon (with the original state never being seen by the reader), or if she was just being her usual Cloudcuckoolander self. Alan Moore's Supreme run starts with the main character finding out that he is not the only Supreme - reality has been revisioned multiple times in history, and all his previous incarnations (be they alternate counterparts, imagined versions or "future" selves) together with all their supporting characters, end up in the Supremacy, a dimension which they turned into a utopia. Later we find out that his Arch Enemy Darius Dax has a similar thing - all his previous versions go to a dimension called the Daxia. When characters from Milestone Universe and new brought by DC Archie Comics 40's superheroes started to pooping out in DC Universe, Word of God said that their worlds has been fused with DC Earth and they were written into it's history, because of events from Final Crisis. Youngblood Judgment Day reveals that Book of Hermes is capable of changing reality and Sentinell used it to not only rewrite his own life but also turn whole world into one that he liked. Avengers Forever reveals that many events of the past has been staged by Immortus and Space Phantoms, cleaning up many Continuity Snarls. In The Flash: Rebirth, it is revealed that Barry Allen's mother is dead and his father, the only suspect, died in prison. For years Barry Allen was one of the few superheroes without a traumatic origin and his parents grew up and old without complication; it turns out it is because Barry's archenemy, the Reverse-Flash, went back in time, killed his mom, and framed his dad. DC's latest revamp of Wonder Woman has Diana not as the first woman to leave Themyscria and make her way in man's world, but as a survivor of a Themyscria that was sacked when she was a child and who is just now coming into her Amazon heritage. This revamp has been stated to be caused by someone meddling with fate, and other characters in the DCU (such as Max Lord) are stunned to find out that few people seem to remember Wonder Woman as she was. Diana's goal is to try and set things right. Eventually Diana manages to set everything right, but her ordeal, likened to the Odyssea, was meant to introduce new changes into the status quo, like a revised outfit and an harder, no-nonsense attitude for Diana, though this too seems to have be retconned by the end of Flashpoint and into her new series. Wonder Woman's pants (and lack thereof) were the cause of so much drama that for several months they were in limbo, though by the time September 2011 rolled around she was again pantsless. In the Sonic The Hedgehog comics, this happens in the Mobius: X Years Later reality (which is separate from the main canon universe). Damage to the fabric of reality from previous adventures threatens to completely destroy the timeline, so Sonic goes back in time to fix it, which results in reality changing - before, Mobius was a Utopia ruled by King Sonic, where all the villains were either dead or at peace with the heroes. But after the changes, it becomes a totalitarian dictatorship ruled by King Shadow and enforced by his Secret Police. Fortunately, the heroes who remember the way things are supposed to be come together and defeat him, returning things to the way they're supposed to be (albeit still with the alternate history). It looks like it's heading this way for the mainstream Archie Sonicverse as Dr. Eggman's Death Egg II has somehow caused history to change, pretty much eradicating most of the SatAM elements and bringing forth Sega elements (including turning Julian Kintobor into Classic Robotnik and appearance of various zones). However, it proved to be temporary - Eggman's "Operation: Clean Sweep" was supposed to rid him of Sonic by rewriting reality and it still failed. Sonic fixes it by going into his Super Mode and using Chaos Control on the Death Egg's power supply to fix it. Or so they hope. There are also shades of this in Silver's stories; everytime he travels backwards in time, he causes small alterations to the timeline. Just not enough to undo the Bad Future he lives in. Doctor Strange: The Oath is a retelling of Strange's origin, but incosistent with original version. As we later find out, present day Stephen has travelling in time to stop a plot of Dormammu, which allowed Baron Mordo to meddle in his history, to make him weaker and more full of doubt. The 2009 Star Trek movie has Nero traveling back in time and killing Kirk's father, radically changing the timeline, creating a brand new continuity. Oh, and blowing up Vulcan, and killing Spock's mom. Can't forget that! Due to a series of Time Travel shenanigans, Stargate: Continuum retcons in that O'Neill's backyard pond now has fish. Terry Pratchett did this in Thief of Time. History was literally shattered by a "glass clock" that trapped the Anthropomorphic Personification of Time, and then patched back together (albeit with some weird gaps and miscellaneous changes) by the History Monks; the plot of the book revolves around the History Monks stopping someone else from making a second clock. It's implied that this explains the prevalence of Schizo-Tech on the Discworld and some of the continuity gaps from earlier books. The entire goal of the Infinite Dragonflight in World of Warcraft is apparently to cause this. In a more traditional way, there's the War of the Ancients trilogy, which RetCons some parts of Azerothean history due to a few people going back in time (like the blue dragonflight being decimated rather than extinct). In the Dragonlance Legends books, much of the plot revolves around the efforts of various characters to Cosmic Retcon stuff they don't like in the past. Tasslehoff is central to this, because kender who travel through time can change the flow of events. First Tasslehoff tries to Retcon away the Cataclysm; Raistlin tricks him into breaking the time-travel device instead. Then Raistlin tries to Retcon away the death of Fistandantilus (since he himself has taken Fistandantilus's place in history), and succeeds, entering the Abyss instead of being blown to smithereens. Finally, Caramon and Tasslehoff wind up in a future where Raistlin wins, and return to the present in order to Retcon everything back to normal. The plot of Legends will give you migraines if you think about it too much. Jake's death, and the subsequently epic time-and-space-altering events that bring him back from the dead in The Dark Tower. The book Starbright and the Dream Eater has one, after Starbright manages to defeat the Dream Eater. She wakes up the next day and finds that every single reference to the "spindle sickness" that the Dream Eater created is instead replaced with a reference to a dangerous pesticide. Every person who got sick from spindle sickness got sick from the pesticide instead, and no-one except her remembers the Dream Eater even existed. Brutally subverted in the Star Wars Expanded Universe. Jacen Solo's brother, Anakin, died. Jacen now has the power to use the Force to time travel. Jacen's new Sith apprentice is Anakin's girlfriend. Jacen's time travel, however, can only alter the events in his memory, not in reality. In Star Trek: Department of Temporal Investigations, one of the characters is completely deleted from history by a particuarly malicious "uptime" villain ("Future Guy" from Star Trek: Enterprise). He proudly refers to it as the most satisfying achievement of his career. In Dream Called Time, Cherijo and Duncan end up in an alternate timeline where they never existed after convincing the Jxin not to transcend (and inadvertently make the universe a worse place in the process). Fortunately, the only effects on them are that they're entirely undocumented and that the only people who remember them are those with ripple-effect-proof memories. Including, somehow, their daughter. The introduction of Dawn on Buffy the Vampire Slayer. And in the spinoff series Angel, the title character makes a Faustian bargain to have his son retconned into having lived a happier childhood and not remembering his real life (in which he was raised by a psychopath in hell) until he goes to college and begins to work out what happened and chooses to befriend his original Dad, remember his original childhood (as well as the retconned one) and maintain his loving relationship with both his real family and his retconned family. Another Buffy example is the episode in which Cordelia wishes that Buffy had never come to Sunnydale. When her wish is granted, the entire universe is revised accordingly, only to be switched back at the end of the episode... but there are some repercussions later, when one of the alternate-universe vampires finds her way into the "real" universe. The latter part of Lost season 5 concerns the main characters, having traveled to 1977, attempting to prevent the plane crash which initially brought them to the island, thus undoing everything that has happened so far in the series. It doesn't work, though it does create its own side-effects later on. Between the old and new series of Doctor Who occurred an off-screen event called the Time War, removing the Time Lords and Daleks (though Russell T Davies was rather reluctant to stick to that) and changing the Laws of Time. It's also a handy crutch for any inconsistencies. In series 5, the cracks in the universe play a similar role, erasing from history, among other things, the Daleks moving Planet Earth in series 4. And one of the Doctor's companions as well. Most or all of these were undone in the season finale however. Expanded Universe has a far more insidious form of this with Faction Paradox's Paradox Biodata Virus. It latches into the part of your biology linked to the Time Vortex... and makes it so you have always have worked for them and always will. The Eighth Doctor was infected, and his timeline nearly destroyed. The Ancestor Cell, based mainly around said Faction, features a huge and weird one with the Doctor's destroyed TARDIS retconning it back, after holding both timelines intact for quite some time, and blasting the sector of space that included Gallifrey into quarks. Occurs near the end of Mighty Morphin Power Rangers. The villains turn back time to a period a decade or so before, and when the effect was canceled, anything that had changed during the reverse-time led to changes in the present day. Most notably, Aisha had moved to a small African village as a child, and Tanya's Adventurer Archaeologist parents had left her in America rather than the African village. Balthazar attempts this in Supernatural, traveling back in time to save the Titanic: this has the effect of ruining Celine Dion's career, creating 50,000 new souls for Castiel, and preventing the deaths of Ellen and Jo Harvelle. Unfortunately for them, Castiel resinks it at the end of the episode. Though only because Fate called him out on it - the whole thing was on Castiel's orders, in order to create new souls for the civil war in Heaven that he's losing. The fourth season of Fringe picks up in a timeline that's been cosmically retconned as a result of Peter being erased from existance at the end of season 3. The differences are subtle—the prime universe Fringe Division has a different lineup, Walter is a shut-in, some characters are now strangers—but most of what happened in the previous seasons seems to have unfolded in the same way, or at least similarly. Kaizoku Sentai Gokaiger has the power of the Greatest Treasure of the Universe, which lets its discoverer rewrite the universe to suit their own desires. The Gokaiger ask if it could eliminate Zangyack, and are told that it would be as if Zangyack never existed -- but that they would also erase all of the Super Sentai from existence too. They end up rejecting the "wish", deciding to take on Zangyack themselves, because facing impossible odds is what Super Sentai members do, and because they don't want to lose everything that they've gained and become as a result of the hardships Zangyack inflicted upon their lives. Nobilis has one of these in its Backstory. Something like 500 years of time were erased, but in an uneven way so that some events moved back the full five hundred years, some a portion of that and some not at all. The souls of all the people on the space colonies this erased are very upset, and seemingly still on the planet they used to live. This is also the goal of the Excrucians; they attack aspects of reality, causing them never to have existed. In GURPS Infinite Worlds, a retcon is called an "ontoclysm" or "reality quake", described as a cosmic event that can change the past and even the natural laws of a given universe. The game even gives rules for attempting to trigger one! It has been mentioned that superhero worlds are especially susceptible to reality quakes, and that any world with magic or super-powers could be explained by "shards" of the previous reality existing in the new universe (which sounds much like the DCU's explanations about the various Crisis of Infinite Retcons). One of the last adventures for Dungeons & Dragons 2nd Edition was Die Vecna Die!, in which the titular evil god gains control of the city of Sigil, a Cosmic Keystone that lets him restructure The Multiverse to his whim. He fails, but the city's rightful ruler, the Lady of Pain, can't put everything back together perfectly. This was implicitly meant to explain away the differences between the cosmologies of 2nd and 3rd Editions. Exalted manages to have its own equivalent of Crisis on Infinite Worlds during a First Age Historical Event called "The Time of Cascading Years". It was a rare foray into Temporal Mechanics for the series; Creation had split into 700 separate timelines, each one with only a single Celestial Exaltation in it. The timelines each reintegrated when that timeline's Exalt managed to save Creation in some massive way... which took longer for some than others. First Age historians basically ended up hand waving the calendar as 'skipping over' the Time of the Cascading Years in the year count, as some timelines were hundreds or thousands of years older than others. The writers primarily introduced it to allow Player Characters in the First Age to have Multiple Conflicting Continuities about "Who saved what from whom with how many chickens", who got to wield the Aidenweiss, and other sorts of badassery that would otherwise be exclusive to historical NPCs. The Mage: The Awakening Sourcebook Imperial Mysteries introduced this as a big trick of archmasters. Via Imperium Rites, they can build off of changes they've already made in the world to alter fundamental truths of reality, retroactively introducing changes to history or cosmology. This is part of how one becomes an archmaster (rendering the facts of one's existence only vaguely remembered to mages and not at all to others), and is the most well understood path to Ascension; you remake the world into one where your transcendence is and always was a fundamental property. Ripple-Effect-Proof Memory is possible, but only to archmasters and only while within their Golden Road. The game Time Hollow involves the main character "fixing" Cosmic Retcons caused by the game's villain. In the Elder Scrolls series, the Warp in the West, which among other things, allowed each of the multiple endings of Daggerfall to be true. |Sonic the Hedgehog (2006), in which the ending writes the game out of continuity. And then Sonic Generations happened, which features a level from the above. City of Heroes has the PsychoChronoMetron, a device that allows psychics to alter the world. It was only used once; as something of an aversion, it caused a Continuity Snarl as the villainous inventor attempts to use it to turn a hero into an ally, without knowing anything about his history. The history of this hero was left... somewhat confused. This happens in Suikoden Tierkreis whenever the world undergoes a radical change. The cause of these events is worlds fusing together, the actual retcon part is an effect of the True Chronicle. The newest Mortal Kombat game has the Raiden from Armageddon broadcasting a premonition to himself around the time of the tournament from the first game. The Raiden of the past is now imbued with knowledge of events to come and sets about changing them (hopefully for the better). Failure, thy name is 'Raiden'. Through the inscrutable phrase "he must win", Raiden ends up making things a lot WORSE this time around. By the end of Mortal Kombat 3, his misinterpretation of said phrase leads to nearly every single Earthrealm warrior dead and just in time for the events of Mortal Kombat 4 to begin with a massively stacked deck for the side of evil. It's still a Cosmic Retcon as he averted the Armageddon and possibly sealed Shao Kahn for good...but at a terrible cost. In Fable II, Lord Lucien originally intended to rebuild the Tattered Spire in order to bring back his deceased wife and daughter, but by the time the Hero of Bowerstone gets to him to rescue the other three Heroes who are trapped by him, Lucien decided that the world itself needed a Cosmic Retcon. However, the Hero of Bowerstone prevents Lucien from accomplishing this and either kills him or lets Reaver shoot him after explaining himself. After this, Theresa gives the Hero the choice of one of three wishes, two of which are in themselves retcons of history. Dave: I guess this proves that time is a closed system, unalterable, our fates inescapable. I guess I'll have a cigarette and brood. Mell: Since when do you smoke? In the Web Comic Thog Infinitron, a movie producer interested in optioning the comic for a live-action movie [dead link] says his offer hinges on the creators making a change to Thog's origin. The resulting retcon sets off an alarm in a time travel watchdog agency. Deletionism...er, Retconjuration is the school of magic that allows the Titans of Erfworld to do this. The original run of Zortic ended with a fight between two cosmic beings creating a big swirly Negative Space Wedgie, which the heroes all fell into. The comic went on hiatus for a short time, and then came back, starting over from the beginning. The original run of Zortic was based exclusively on parodying popular science fiction franchises; the two cosmic beings were arguing over the merit of this. The new version is intended to be more original and less parody-driven. Homestuck: The Scratch is a Reset Button for the universe itself. An explicit power of the Big Bad in Captain SNES. So far, it seems she can only retcon things within the framework of existing backstory, fleshing things out in a way favorable to her... but its implied that at full power, she isn't so restricted. In The Spoony Experiment, Linkara punched the wall in order to bring back Spoony a la Superboy Prime, but only succeeded in changing Donna Troy's origin story again and turning Dr. Insano into a man. In the second season of Danny Phantom, Danny accidentally gets his ghost powers removed by a Literal Genie, leaving Sam to recreate the event that gave him his powers in the first place, except she puts a "DP" logo on his suit so that he'll have it in ghost form. When she decides it'd be easier to just wish everything back to how it was, she does so, but specifies that the second version of him getting his powers be the canon one, because she really likes how he looks with that logo. Fry's travel back in time created his time-copy, which also allowed to retcon the most heartbreaking episode of the series. In fact, the whole Bender's Big Score movie is just made of this trope. It even leads to a giant rip in the universe by the end when Bender meets all of his past selves hidden in the caves under Planet Express with all of history's treasures and convinces them to all emerge at the same time instead of when they were supposed to, at which point Nibbler exclaims "Everyone out of the Universe!" and eats himself. This page was last edited on 15 September 2018, at 06:14.